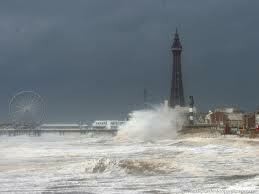 And so to Blackpool, the saucy seaside capital of the UK and perhaps the world. As we made our way along the M6, leaving the magnificence of the Lakes behind us, the rain painting the world grey and the windscreen wipers giving a reluctant squeak every time they were obliged to swish, we wondered whether this was perhaps a bit of a mistake. We prepared ourselves for a tacky B & B and greasy breakfast, we encouraged each other to believe that this was “just a bit of fun” and we cheered ourselves up with the thought of gatecrashing the Soul Weekender on at the Hilton in Blackpool (Hilton and Blackpool in the same sentence just doesn’t sound right). We had just about convinced ourselves that leaving a roaring log fire behind and spectacular scenery was a good idea when we arrived, parked the car and were nearly blown off our feet by the wind. We walked along the front at a 45 degree angle bracing ourselves against the wind, ignoring the squally rain looking for a half decent looking B & B. Bruce went into a Hotel to find out the price – £75 pppn, er no I don’t think so. We went back to the car and that’s when we spotted The Hotel Babylon. Immediately our expectations of shabby B & B in Blackpool were blown right out of the window; the reception was immaculate and brightly decorated and David greeted us warmly and offered us the Babylon Suite for £60 B & B for both of us. As we walked up the stairs I did wonder about the name of the Hotel and whether we would find a bedroom with swingers gadgetry and gizmos, alas I was to be disapointed. The room was spotless with a sumptuous bed, a tiny but perfectly formed en-suite, coffee making paraphernalia stashed away in a caddy, two chairs in the bay window and even two bathrobes. There was even an ice-bucket and two wine glasses, the perfect romantic hideaway. Not a hint of seediness or swinging, unless you count the box of tissues by the mirror. The bedroom furniture was modern cherry wood and all matching and the walls and carpet were neutral. The bedroom was as good, if not better than any 4 star hotel and we let out a sigh of relief and even a hint of a smile – maybe this wasn’t such a bad idea after-all. 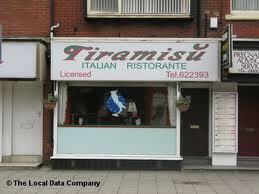 Time to hit the town and head to Restaurant Tiramisu, an Italian restaurant recommended by David. It was packed but we managed to get a table and we were then entertained by the waiter/restaurant owner who had a few tricks up his sleeve. It is an authentic Italian Restaurant and our meal was excellent, as was the wine and the Limoncello. Waiter man bought over coffee and did his party trick of pretending to trip with a full cup of coffee, the cup was in fact empty. We started chatting to a gay couple who had a holiday home in Blackpool, even though it was only an hour to where they live. They explain that whatever entertainment you could wish for was here in Blackpool and as we chatted I began to understand the attraction of Blackpool; it is truly cosmopolitan with a great mix of people and even in the depth of winter it has a beating heart. We felt full and happy (drunk) so we left and decided to go and dance off the delicious puddings at the Soul Suite, a pub that plays, you guessed it, soul music. We decided against gate crashing the Hilton as it was too far away and we were weighed down with food and wobbling with drink. We entered the pub with a flourish, like John Travolta and Olivia entering the dance competition and twisted and shimmied our way to the bar. They were playing old soul, Motown and a bit of northern, all good but a bit of new soul wouldn’t have gone amiss. We requested Otis and Carla Thomas singing Tramp and when the first notes hit the speakers we took to the dance floor and promptly cleared it. Oblivious of anyone else we did some ‘moves’, mouthed the words and acted out the song. We were quite obviously the best thing to hit Blackpool for a long time, until we woke up the next morning and peed ourselves laughing at what utter nutters we must have looked! 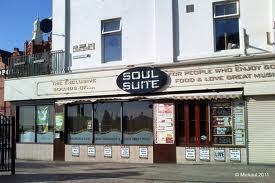 We left the Soul Suite in the wee hours and staggered back to our hotel room for a bit of sauciness – oh er Mrs! The following morning we made our way downstairs for a a lovely breakfast including freshly prepared fruit salad. A little worse for wear we packed and left for our journey home. What a weekend! Did we enjoy Blackpool – yes! Would we go back? Yes, out of season. 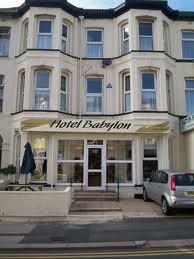 Would we go back to Hotel Babylon? Absolutely!!!! This entry was posted in Blackpool, Eating Out, Italian, UK Hotels and tagged Blackpool, Hotel Babylon, Otis Redding, Soul Suite, Soul Weekender, Tiramissu. Bookmark the permalink.